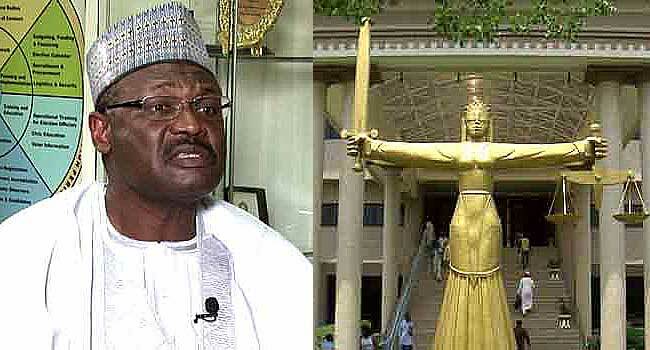 A Federal High Court sitting in Abuja has ordered the arrest of the Chairman of the Independent National Electoral Commission (INEC), Mahmood Yakubu, for failing to appear in court. Justice Stephen Pam issued the warrant of arrest on Thursday after Mahmood’s absent in court for the third time. The judge asked the police to effect the arrest immediately. Justice Pam had on July 5 ordered Yakubu to appear before him to show cause why he should not be sent to prison for contempt of court. Five days later, on July 10 when the court sat again, the INEC boss did not show up. His counsel, Mr Adeboyega Awomolo, informed the court that his client had filed an appeal challenging that order at the appeal court and another appeal before the Federal High Court asking for a stay of proceedings pending the determination of the appeal. But counsel to the plaintiff informed the court that contrary to the claims of the INEC counsel there was no material evidence before the court to stop the order of the court or the hearing. In his ruling (on July 10), Justice Pam held that the fiat by the Chief Judge of the Federal High Court to hear the matter subsists. The judge, however, adjourned the case to August 1 (today)to allow the INEC chairman to attend to his mother’s funeral but insisted that the INEC boss must appear before the court as ordered at the next sitting. But when the court reconvened today, the INEC Chairman was absent, a development that led to the order for his arrest.